I’m getting caught up on uploading my entries for the Rubber Onion battles… Here’s June’s entry: The topic was Handshake Fail. Once again, I thought that using stick figures would make things easier. Once again, I was wrong. It did cut down on the secondary motion of clothing, hair, and other stuff, but body positioning is body positioning. I’ve not done any kind of fight choreography before, so that was fun. Per current battle rules, I submitted it here on Instagram. It’s the first time I’ve done this, and I’m really enjoying it. It makes me kick out content quickly – and lets me see how quickly I can kick out content. If I have the focus, I can work fast. This is really good for me to know, and to internalize, considering some of the longer form projects I have in the planning stages right now. (More on that later). It’s also great to be in contact with a community of animators! Under the #rubberonionbattle hashtag on Instagram , everyone comments on everyone else’s posts, whether they are works in progress or finished submissions. It’s a very positive, encouraging space. I’m enjoying meeting everyone, and seeing the creative and diverse spectrum of styles. I think animators are a unique breed in how we see the world, and this is a neat way to be in contact with part of the tribe. Really looking forward to seeing how these battles inform my progress. My two year project is finished! It is a wedding present for my wife, Elizabeth Perryman. It features our inner children and Chicago, her home city. I was able to show it at our wedding reception, which meant the world to me. I learned so much from this project, and I’m really proud of it. This is a really personal and in-depth look at mental health. I highly recommend it, especially to see how the animator employs a vast arsenal of visual symbolism. Probably the most successful film I’ve seen at having me as a viewer embody the experience of hearing voices, the dropping feeling of a mood dive, etc. So well done. This film is delightful and profound both. I hope you can enjoy it like I have. I may write more about it later. I’m taking a bit of a break right now from writing and the blog. I never know how long those might last as this healing journey (called life) demands my moment by moment attention. Occasionally, my dreams will turn up some imagery that sticks with me: Last night it was this waitress, with her jet black pigtails, striped tights and green bows on her shoes. She was highly enthusiastic about her job, I could tell that she loved it. She was going on and on about the dessert buffet, how you could make anything you wanted and it had every dessert imaginable. Later on in the dream, I saw a small section of the buffet, and it had the most colorfully frosted sugar cookies I’ve ever seen. They looked like tie-dye shirts. Dreams have been a powerful creative force for me, so when I can, I’ll draw some of the visual content from them to connect with them better. I have no idea what this dream means, but it is the second dream I’ve had this week that features a dessert buffet, so I figured I should probably have a sugar cookie. 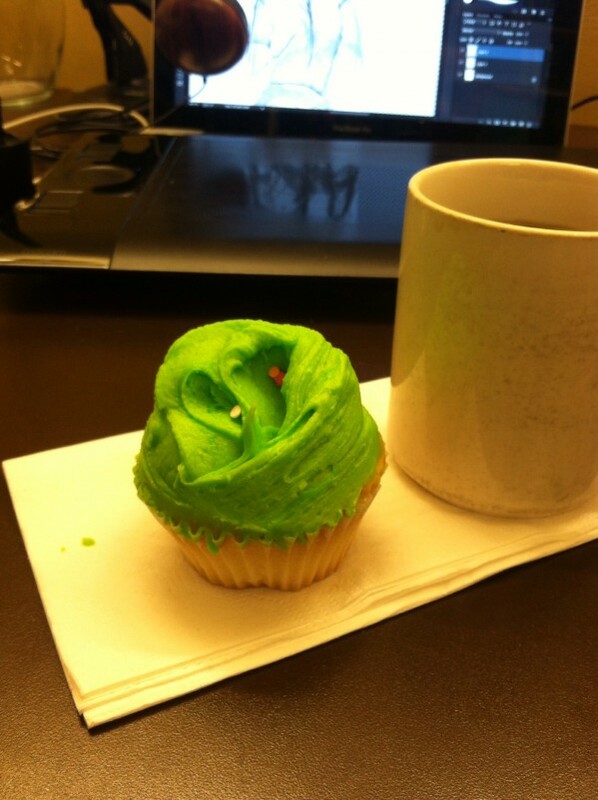 This cupcake was close enough. 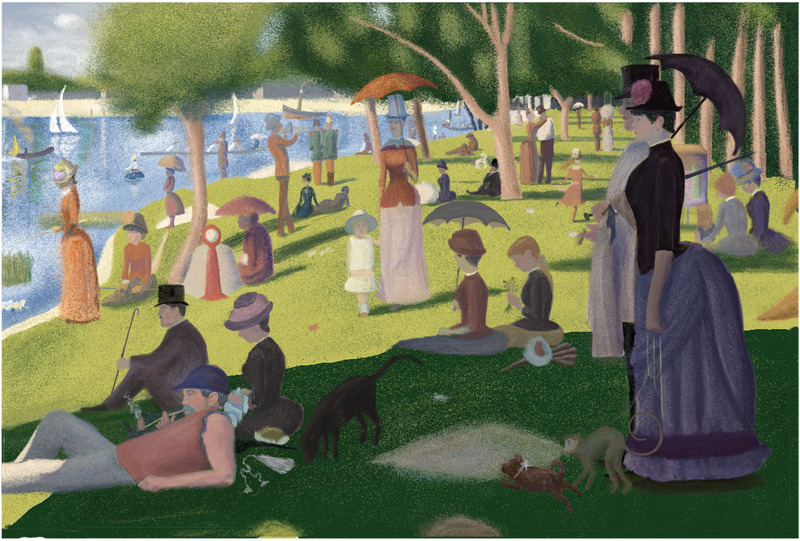 Lake Shore Drive, my current animation project, features a scene in which my characters are inside the Art Institute of Chicago, and they are contemplating the famous Seurat painting A Sunday Afternoon on the Island of La Grande Jatte. I decided I would copy the painting, instead of importing a jpeg of the original. This will allow me to change up the picture later for a subsequent shot. 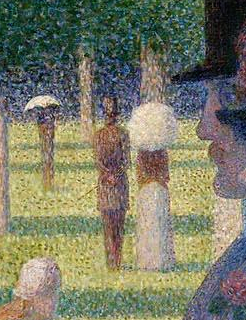 Pointillism is wild. I used the color picker tool, just for fun, on a piece of the original that I was *sure* was blue, or purple, or orange. It threw colors back at me that I never dreamed would be in there. And the construction! Each figure in this piece is a fully realized character. The more you zoom in on any one of them, the more the personality jumps out at you. (Don’t zoom in on mine; it has the opposite effect.) 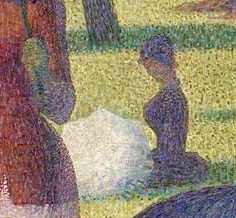 I love what Seurat does with texture, volume and shading. 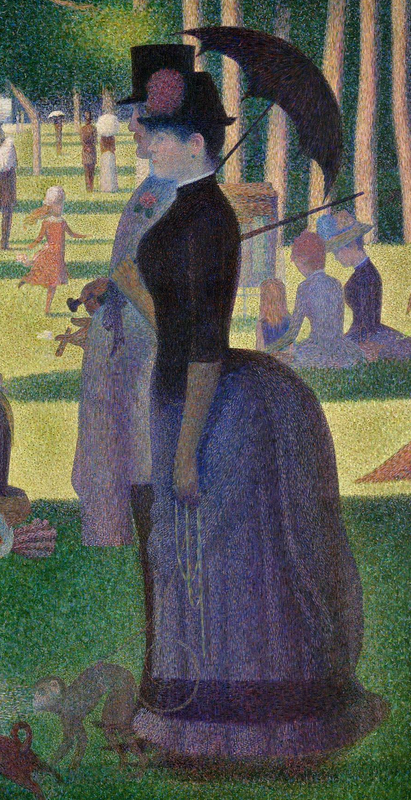 I wish I could have attempted to draw it freehand, and spent longer studying the nuance of the pointillism. But time passes quickly, animation is tedious, so, moving on. However, I am glad I spent the time I did to copy this piece. It was an excellent learning experience. But, now that I’ve finished the copy job, I have questions. What’s up with these certain pairs of wooden characters? 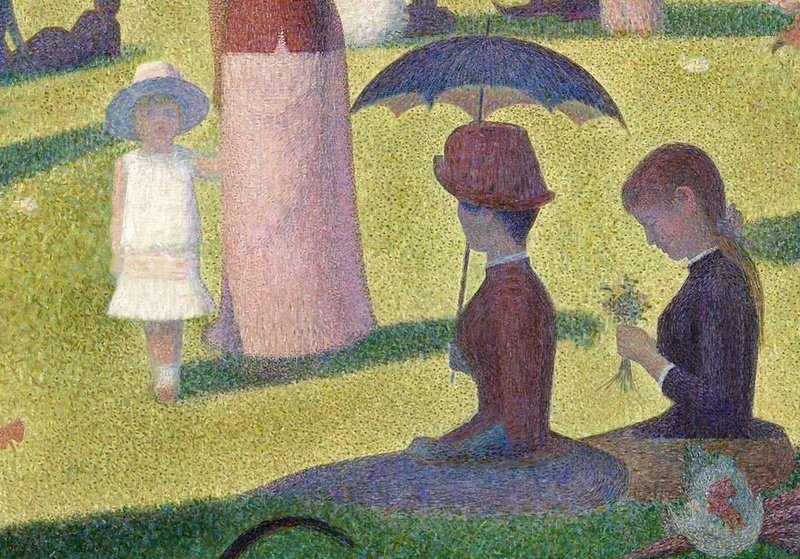 Everyone else looks human in the painting, even if they appear relaxed, or disengaged. But these guys are standing at attention like Beefeaters at Buckingham Palace; particularly Pair #1, who actually look like soldiers. 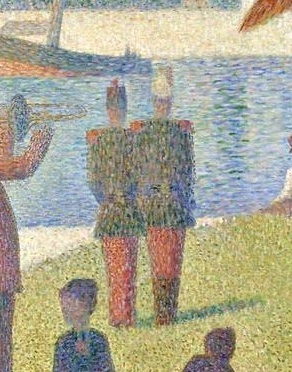 But even if they are soldiers, why are they standing at attention all by themselves, in the middle of a relaxed Sunday atmosphere? The couple in the foreground are doing the Zombie Stance as well, but they are in profile, facing left, so it’s not quite as obvious. Nonetheless, they appear to me to be standing stiffly, in the midst of everyone else looking relaxed. Also, the monkey. Does it look slightly transparent to anyone else? Like it may not really be there? I’ve read that the painting could be interpreted as the isolation felt in the company of others; no one is making eye contact with anyone else. They are each in their own world as they recline on the bank. The little girl in the white dress is, as far as I know, the well-known exception. 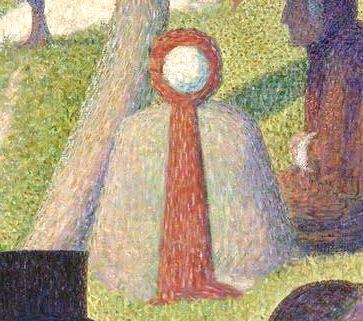 She appears to be staring out of the painting at the viewer. 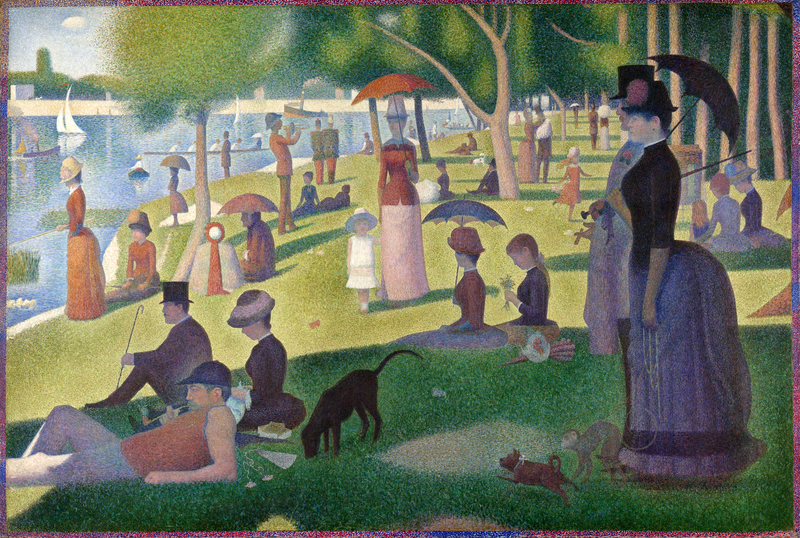 But what about the lady with the red hat? Does she seem to be looking directly at the little girl? And if so, what does that mean? 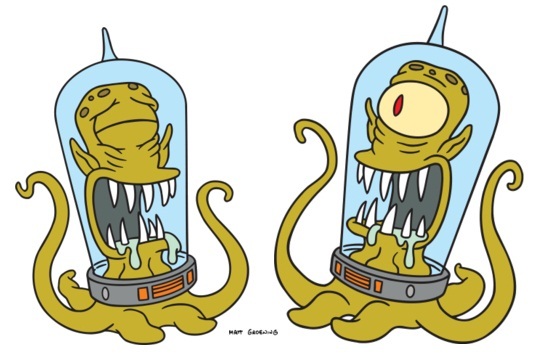 And these things are crazy… what are they? I’m sure a Google search could probably answer my questions. But, again: Giant project. Must go finish. If anyone has an answer for me, or would like to ridicule my lack of knowledge of late 19th Century French standing postures and artifacts, please feel free to leave a comment.